There’s no heat that’s as cosy as a wood heat. I posted before about the old wood stove, and how comforting a heat it gave off. While the old stove has faded from use in favour of the electric range, many people still use wood for their wood furnaces or 24 hour burners. Back home, getting your wood usually means do it yourself. There’s not a ton of hardwood on Random Island, a few stands of birch and maple, so most people’s winter wood is fir and spruce. Typically we’d go in in the fall of the year and cut what wood we needed for the upcoming, or perhaps even the next winter. We’d lay a few sticks length wise to keep the major portion of the wood above the damp ground, and then stack it as you see here to start the drying process. We’d leave it in the woods until winter, as there was no easy way to get it out before. Once winter came, we would hook up the horse to the old slide and off we’d go. Of course the horse has been mainly replaced by the ski-doo and atv’s now, but the slide remains pretty much the same. 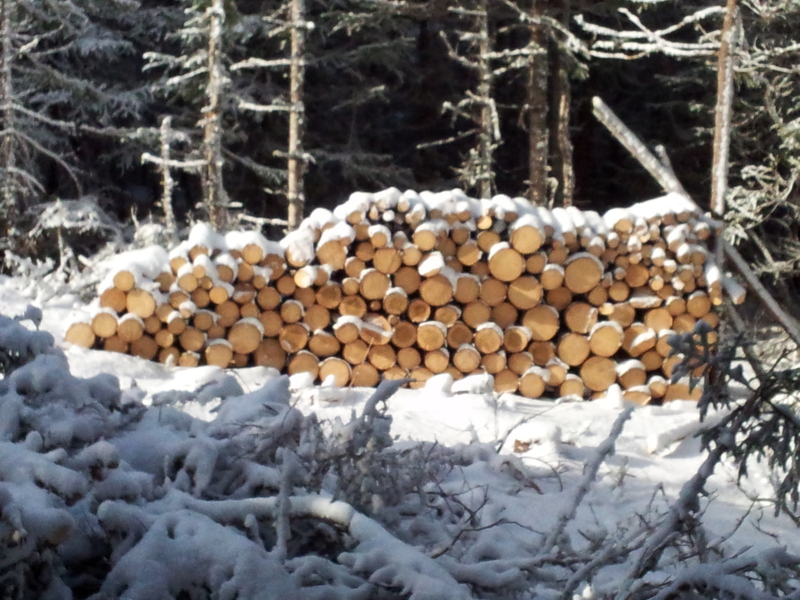 Once it was out, it would again likely be stacked closer to home, but left untouched till spring and summer. 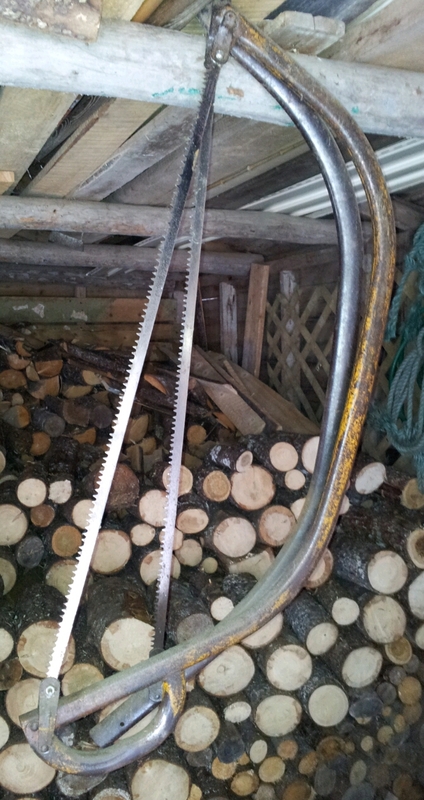 Once it got warmer, we’d break out the old saw horse, and start cutting the wood into junks. When I got older I used the chain saw, but before I was allowed to handle it, the old bucksaw had to do. It was actually more fun, if slower with the bucksaw actually, just something about using it. We’d then usually stack the wood outside again, maybe on a few slabs to keep it off the ground, and let it sun dry for the summer. Once it was dry, we’d split the larger junks with an axe, and stow it all in the woodhouse. Typically we’d have piles going right to the beams. I can still remember dad’s admonishments to alternate big ends and small ends so it wouldn’t tip. Am nostalgic for it now, but I have to admit it was hard work, and there was little I hated more as a kid than the chore of filling the woodbox and cleaving splits every evening. Oh yes, splits! Well I guess nowadays people call it kindling and buy it in bags at Irving! But back then we took slabs (a topic for another day) and propped them up and split them into, well splits for our kindling. I actually enjoyed making those, just not so much bringing the wood in.